For the first time in Ukrainian history, the situation with animals in Ukraine was marked by not only negative news but there were also positive changes. The most remarkable advancement was noticed in Kiev, the capital of Ukraine, where the City Authorities shifted their policies towards humane ways of reduction stray animal population. Here the municipal services not only neuter and actively rehome stray dogs but also provide them vaccination and treatment. More than 3000 stray animals were neutered this year with the help of Kiev administration and European animal welfare organizations. Kiev Center for the Protection of Animals started implementing the regulations proposed by Naturewatch and thus using the European model of caring for animals. A notable progress can be observed also in Volyn region where the amount of stray dogs decreased by 30%. 305 dogs were neutered by European animal welfare organisations, a shelter for over 400 dogs was built and is partially funded by city authorities, although the most of expenses are covered by a local NGO. The Lutsk government has implemented a stray animal control program for 2011-2016 according to which all stray dogs are to be caught, neutered and released with exception of aggressive and injured dogs who remain in the shelter and are rehomed. Every day volunteers of this shelter are trying to rehome dogs and cats at a specially equipped place at a local market. These results, as well as having won two legal cases to protect animals, are actually not the work of one year, but Lutsk NGO volunteers have been working very hard for more than five years but only this year they have started to get positive results and their work seems to be a good evidence that they are gradually solving the stray animal problem in Volyn. In Kharkov, the municipal shelter is working closely with Naturewatch Foundation to improve its facilities and practices to bring them in line with European standards. In October 2012, the municipal shelter hosted a seminar that was conducted by Naturewatch Foundation, which was attended by shelter managers and staff from 15 municipalities across Ukraine. Other regions where the situation is changing towards reducing stray animal population and humane animal treatment are Lviv with its shelter doing a massive work and Odessa with its neutering centre that neuters not only strays but owned pets that leads to drastic reduction of stray dogs and cats in the streets. It is an efficient approach to neuter owned pets because they are the main source of stray cats and dogs in Ukraine. Naturewatch has triggered this new direction in which local governments are managing their stray dog problem, by not only dealing with the stray dogs but by sterilising pet dogs. This aspect is vital because it addresses the root cause of the problem: by restricting breeding of pet dogs we dramatically decrease the number of unwanted puppies who would become stray. This approach together with educating pet owners and municipalities and with implementing humane legislation has good chance of solving the problem of stray animals in Ukraine forever. 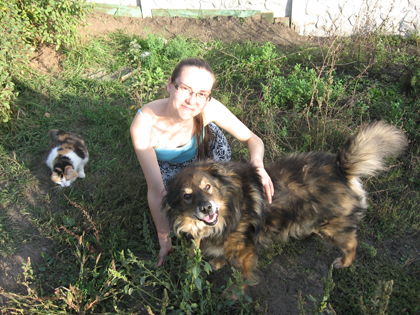 Natalie has been working tirelessly in Ukraine to help stray animals for many years. She is a dedicated and highly valued member of the Naturewatch Foundation team, running our Sterilisation Project in Ukraine and organising our training seminars and workshops for local governments. In addition to this, Natalie spends her spare time finding forever homes for stray animals, many of which she fosters in her home.